My six top tips for "Strategic Shopping"
Over the years I've been lucky enough to work with the Fort Shopping Park several times, so I was delighted to be asked to be involved in bringing to life their latest research surrounding the "Theory of Shopping". I was gifted £100 and asked to utilise some tips to assist with strategic shopping. Well if that wasn't right up my (high) street then I don't know what was. Bring it on! I was also asked to create a shopping guide encompassing these tips, so here goes. I have a few tips when it comes to shopping against the clock. First, shop alone. That way you only have to go where you want to go and look at what you want to look at. That may sound selfish but when time is of the essence and you have to succeed, it just makes sense. Secondly, set yourself a time limit and keep an eye on the clock. I gave myself two hours to achieve everything and I left exactly two hours after I arrived. It would have been easier to spend longer shopping but keeping an eye on my watch meant that I spent my time wisely. Thirdly work from a list that you've made in advance - you will be much quicker that way. Oh and wear trainers! To be a true strategic shopper, you need to do your homework. Know which shops you want to go to and where they are in relation to one another, so that you avoid doubling back. If you don't know the layout of the stores, head straight to an Assistant and ask for what you're looking for. Shop at a time of day that is quieter so that you can see everything more clearly. Does buying a Boots meal deal for my lunch count? I think so! That saved me quite a lot of money. There are some seriously good offers and sales on at the moment (although more about those later.) 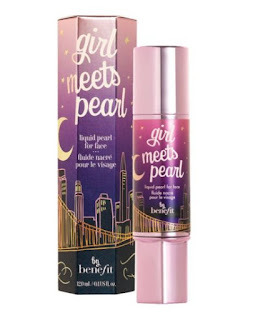 Money saving tips can involve anything from buying High Street versions of designer looks to utilising discounts from Magazines, to taking advantage of 2 for 1, or 3 for 2 offers or in my case, asking for samples of products that I thought that I might like to try but that which I wasn't quite sure about such as this Benefit girl meet pearl primer and highlighter (£25). There's only one way to tackle the sales and that's early in the day - or late in the month - when there's not that much left and it doesn't look like a bun fight. I try only to buy things that I saw and loved when they were full price, rather than going off on a sale frolic which is destined to end in disaster. The best bargains are to be had as the sales are nearing a close and the stores are desperate to get their new season pieces in. Listen to your gut instincts. If your heart sings, say yes! If you're not sure, or if you need to ask someone else's opinion, the chances are you know in your heart that it's not right. If something is too tight or if shoes are slightly too small, leave them for someone else. They could be a very bad buy. If it's a one season wonder (unless it's a real bargain) again, leave it. 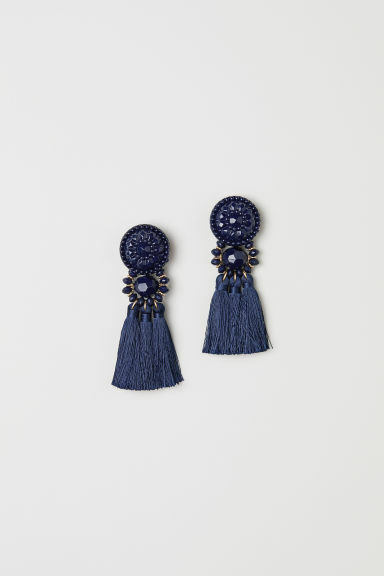 Tassel earrings are proving themselves not to be a one season wonder and they really make my heart sing! A leather jacket could be a brilliant investment but if you're not sure that you're going to love it, trying a non leather jacket. This one from Oasis (£55) is definitely one to say yes to. And a classic investment is always a good buy. 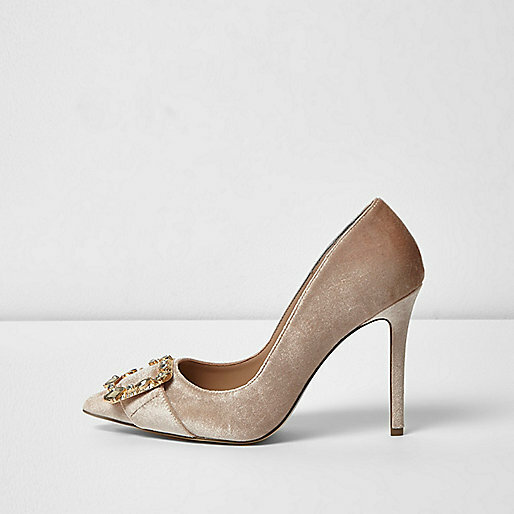 These shoes from Next ticked my "when to say yes" box for a number of reasons. First, I can see myself wearing them for many seasons and on many occasions. It's also worth me spending more on shoes because I find so many of them hard and uncomfortable on my feet. The key to this has to be by buying wisely. It's a bit like answering the question "how do you stay married?" Largely by choosing wisely before you say yes. See, it's the same principle! So let's assume we're talking about clothes. The cost per wear factor may well come into your decision making process. Think about how you can style something up, or down, as well as how you can layer it up or down. Can you wear it all year round or, like linen, is it quite a seasonal fabric? Can you wear it both in and out of work? Take for example a black blazer - style it up over a party dress or down with jeans, wear it to work or at the weekend, wear it with a cami underneath or a crew neck jumper - your choices are endless. The other thing I advise is using the things that you have bought straight away. Use them, love them and wear them to death. That's getting the most out of your purchase, rather than it sitting in your wardrobe "for best." And actually I advise spending less on clothes for a one off occasion - even a wedding. The cost per wear of those items can be astronomical. 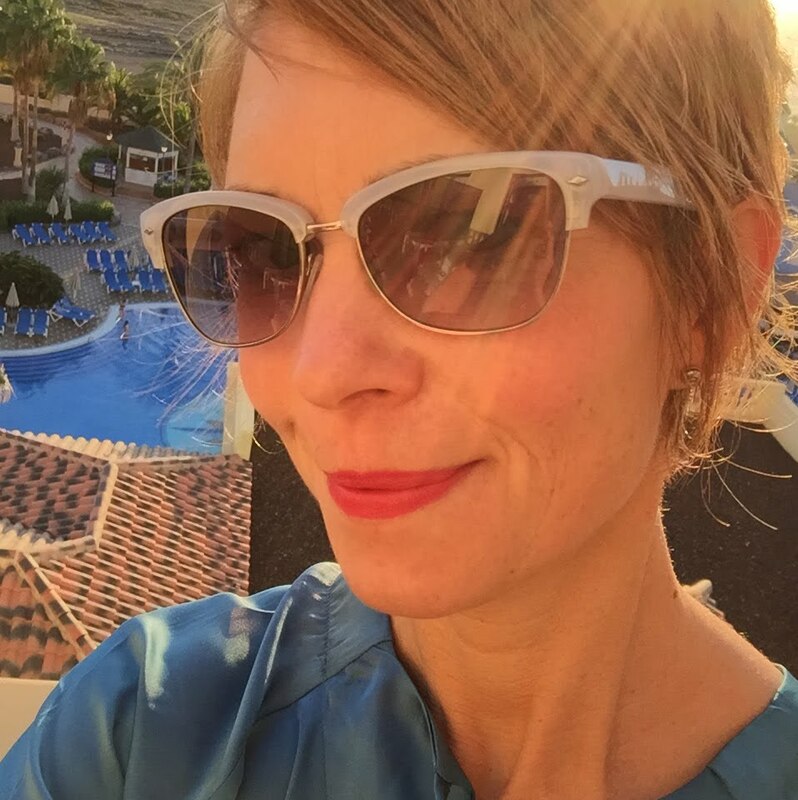 Do you have any fabulous shopping tips that I could include in my guide? If so, I would love to hear them. There are not many things in life that I would say that I'm the Queen of but when it comes to layering, that crown is well and firmly on my head thank you very much. But this post isn't about the obvious that we reach for to keep us warm in the winter - the scarf/hat/gloves/thick jumpers/duvet. Oh no. It's more about those pieces that we can layer under, or over, what "normal" people wear, so that we still look like we're wearing a "normal" outfit and so that we don't have to go around looking like the Michelin man from October until April. I've come up with an arsenal of weapons to help fight the cold. These I bring out year after year, literally, and they are a fail safe way of making summer clothes last into the winter and to stop us from having to wear winter clothes into the summer. Let's start with a vest. A vest is always a good place to start when it's cold. The Jigsaw vests are lovely and comfortable with a nice lace detail, straps which can be altered plus they come in about 9 different colours. They are particularly great if a bit of vest is going to be peeking through - say at the neckline of a denim shirt or something. Then for the every day work horse type vest, you can't beat good old M&S, or H&M (who do long line ones), or Next. A vest is the first piece of clothing that goes on after my undies. You have to start layering early on in the construction of an outfit. 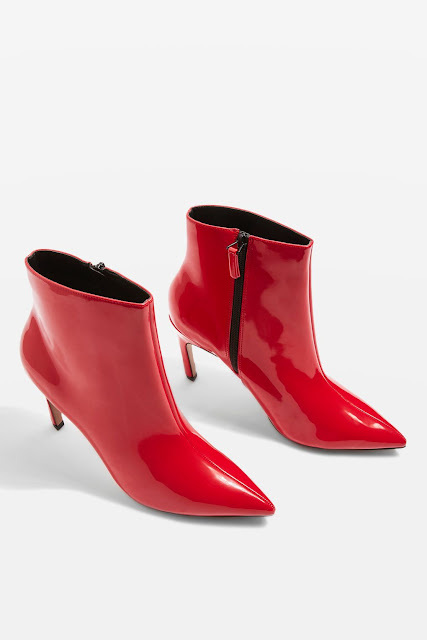 You may not know it yet but you absolutely need these babies in your wardrobe if you want to wear a midi dress and do an ankle flash at any point in the year beyond, say, mid September. I bought some from Primark and they key is to have them loose enough around the ankle so that they can be turned up. Thermals poking out from beneath the hem of your dress is not a good look. Nope not at all. But one sadly that I think I may have participated in inadvertently :( I had these on as part of the above outfit. So then I quite often (no, pretty much always) have a long sleeved cotton top over my vest. Last year I bought a stack of scooped neck ones from H&M just like the one above. I must admit that on the day I wore the above outfit, I didn't have a long sleeved top on as it would have been a bit bulky under my dress and it might have shown through at the neck. But they are definitely necessary about 75% of the time. Now a ribbed neck polo is the best thing against the cold. Fitted but not too tight is the order of the day. It's a great layering piece under all of those summer dresses that run out of steam come the end of September. And with a vest to go underneath it, plus thermal leggings, you're absolutely sorted. They're also fab under dungarees. Trust me. 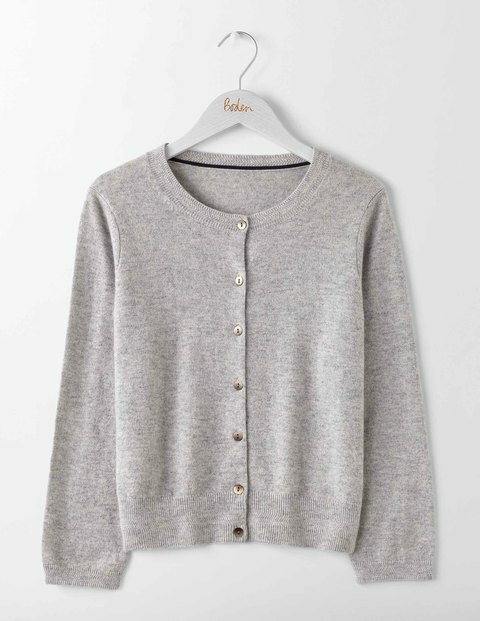 If you feel the cold, you really need one of these cropped cardigans from Boden. There are two choices, the cashmere one and the favourite cropped cardi, which is 80% cotton. Mine is never far away from me and although it's rarely on show, it's working behind the scenes underneath a biker jacket, adding an extra layer of warmth. I'm wearing mine as part of the above outfit but it doesn't add bulk and no-one would ever know. A layer over the dress, as opposed to underneath it, also stops the dress from becoming too tight. 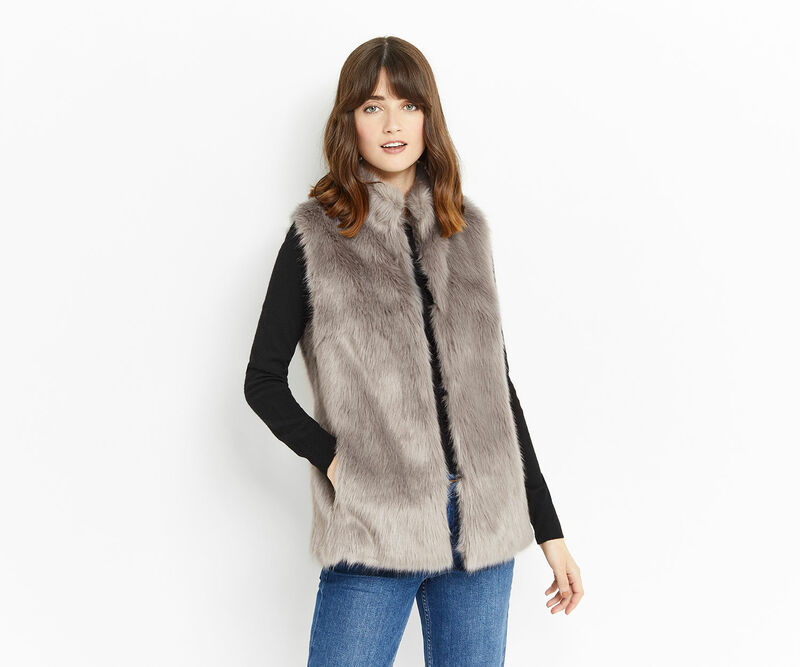 If you've got a coat that needs a bit of help in keeping you warm, a fake fur gilet like the one above does the job brilliantly. 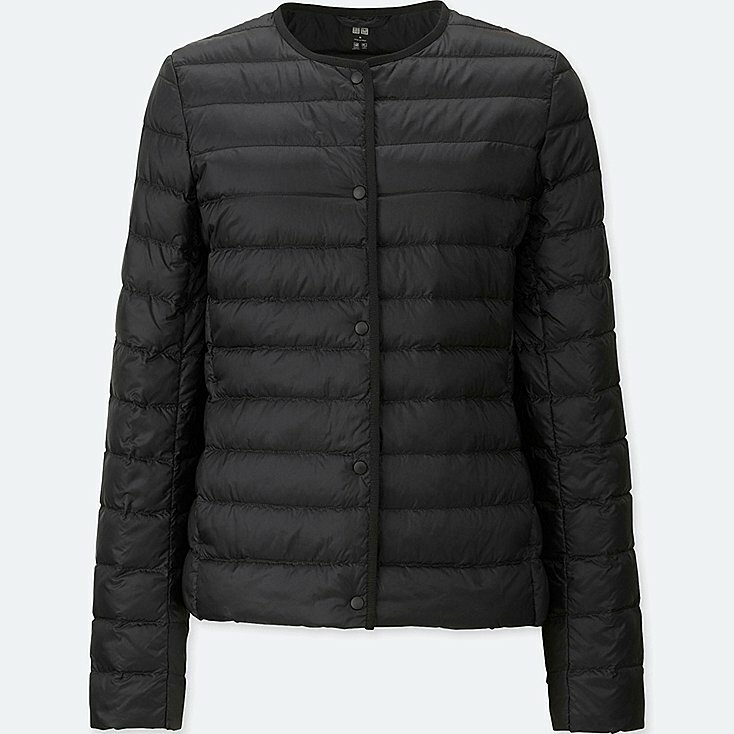 Coats can be hard to layer up because there's often not enough room in the sleeves, which is where the gilet comes in. It adds warmth to your torso but means that you can still get your arms in the sleeves. True, depending on the fit you may not be able to get your coat done up but if the gilet has a fastening that's that problem sorted. Equally they look good layered over a biker jacket. Finally, although I don't have one of these jackets yet, I've always thought that they look such a good idea to have squirrelled away in your bag. I've seen my friends dive into their bag to pull out what I thought was going to be a tissue, only to produce, magician like, a coat. For those days out in London where it can go from freezing to really warm, one of these would be perfect. There are various heat tech type garments available which I may investigate another time for those truly freezing days but for now, I've stuck to what is pretty much available in your standard shopping centre. 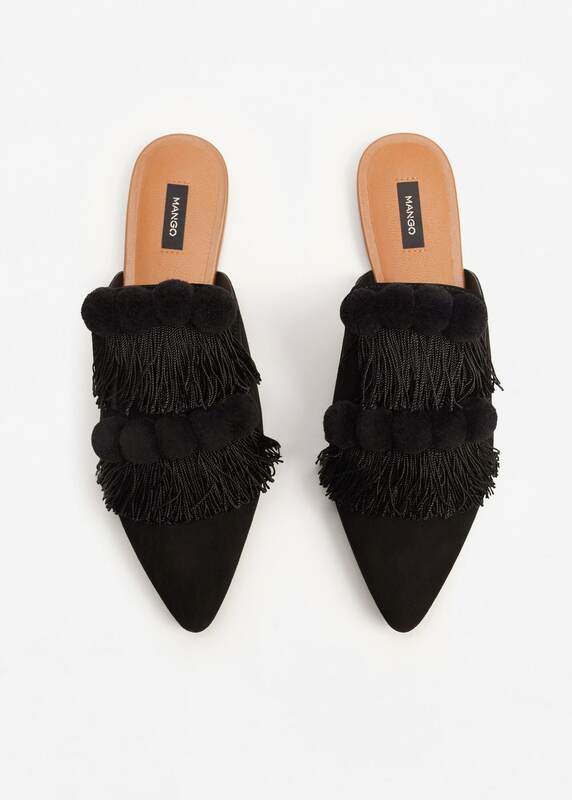 Velvet shoes - comfortable and chic! I'm all for comfortable shoes. Gone are the days when I'm prepared to tolerate any kind of discomfort in the shoe department - although to be honest I'm not sure that I ever was. Maybe shoes just hurt more these days. But what I have discovered (huge drum roll please) is that velvet shoes are the best. They're soft, they come in all styles, velvet is a great - albeit not terribly hard wearing - fabric and what's more, they're often quite reasonably priced. I think where velvet shoes really come into their own is for a night out. Heels and leather can sometimes be a terrible combination. Heels and velvet however, well that's a whole new ball (of the foot) game. And of course instead of writing completely about velvet shoes, I'm going to start with a pair of leather ones. I love these. I keep looking at them. 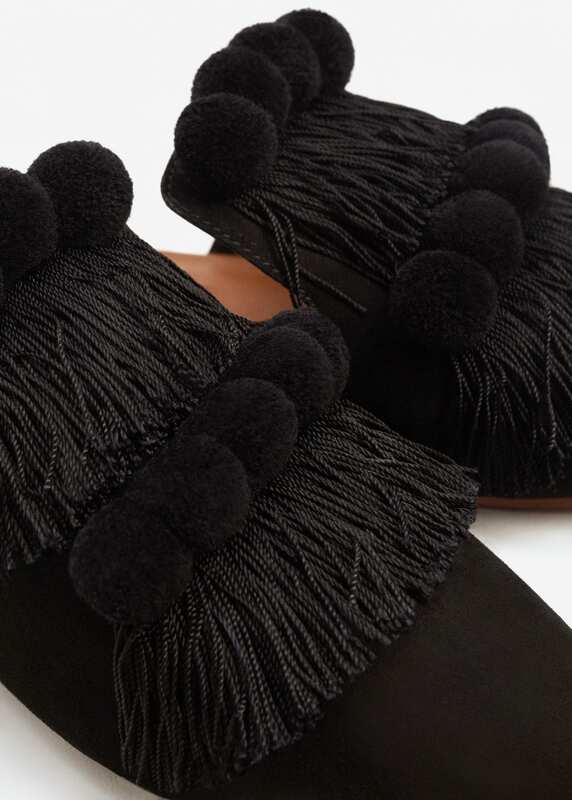 Backless loafers with pom poms and tassels? Craziness in a pair of flat shoes. 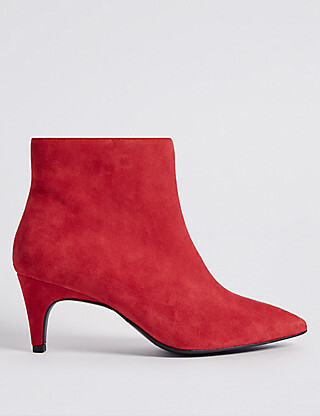 And speaking of craziness in a pair of shoes (but this time velvet ones) - finally I'm getting back on point - these are on their way to me as I type. Pink, with a lobster on one shoe (anyone remember the whole "Friends" lobster thing of the 90's? 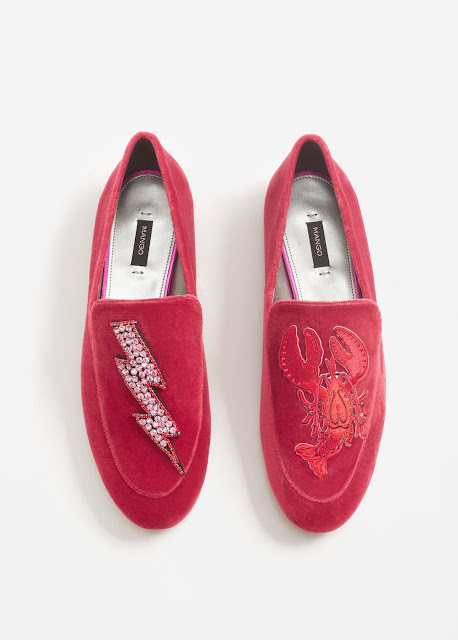 We have a house full of lobster stuff) so what better reason to buy lobster shoes? 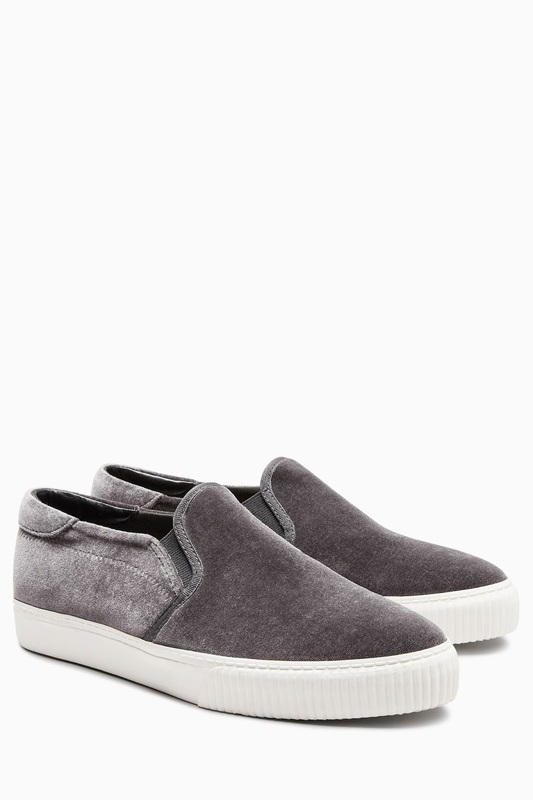 And for something else flat, gorgeous and comfortable, take a look at these slip on loafers. Great colour and a good all rounder for now and into the summer. And then the heels! Let's talk about the heels. These are so gorgeous. They're a beautiful pink colour and the adornment is pretty. 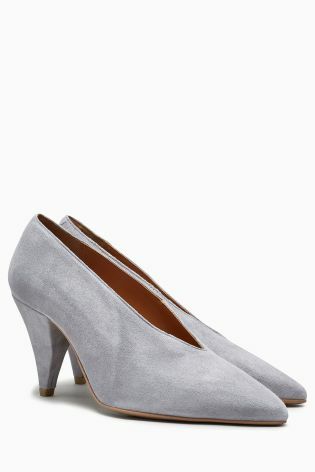 Perfect Cinderella shoes for a great pri(n)ce. And I can vouch for the comfort of these because I have a pair. 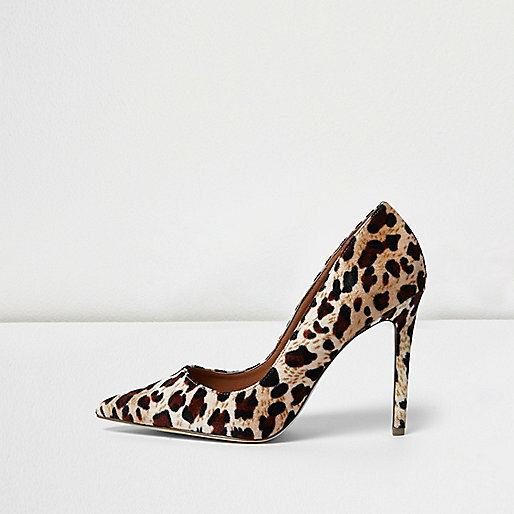 If I'm going to wear a pair of heels, they are likely to be these. 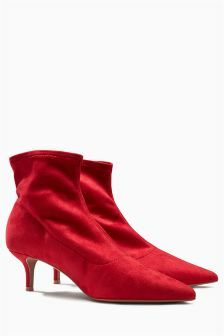 Whilst I get that none of these may appeal just bear velvet in mind as a shoe option. Velvet is for all year round - not just for Christmas! There was a time when gingham was only worn by those going to fancy dress parties dressed as Dorothy from the Wizard of Oz, or by those wearing it as a summer school uniform i.e. the under 11's. But now? Well now it's everywhere. There's just no escaping it - which doesn't mean that we have to wear it but if you fancy it, perhaps now is the time to give it a try. I have two distinct memories of wearing gingham. On my 7th birthday I was presented with a pale pink gingham shirt and some denim dungarees made by my step-mum and I loved them both. Thinking about it my outfits choices haven't really changed much over the last 40 years have they? I also bought a pale blue and white gingham shirt in Bali when I was travelling. I loved that shirt. It had a tie at the waist and it was probably the most sophisticated piece in an extraordinarily non-sophisticated travelling wardrobe. So the Topshop skirt above, I owned for a while and although I liked it I didn't love it enough to keep it, so I returned it. But don't let that put you off - the length is great, it has a little split which means it's OK for taking big strides in and it was comfortable too. It also comes in plain colours for anyone who likes the idea of the style but not the gingham. You know how I mentioned that the skirt came in other colours? Well here's one of them! And it's worn with this mutton sleeve blouse from Topshop (£29) which I first worked with a few weeks ago when I went to talk to some soon-to-be 6th formers. I loved it then and I still love it now. It's not as fitted as some tops, so that's just something to look out for but tuck it in, nip it in with a belt or just leave it loose for a more relaxed look. However this option from New Look (£19.99) looks more fitted so it could be a better option for some. 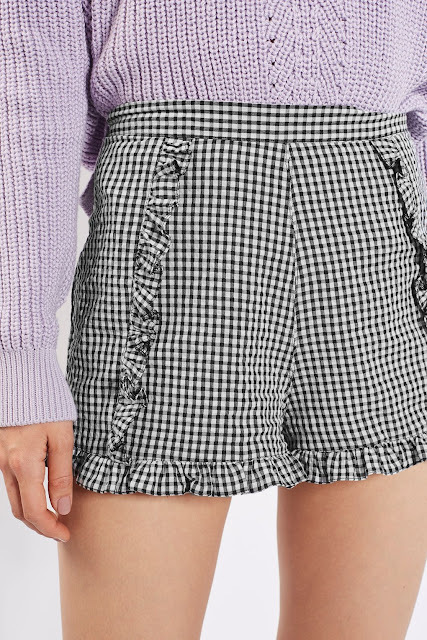 And for outerwear, there's this gingham cropped frill jacket from Topshop (£49). This jacket also comes in four other colours and if I was contemplating buying a summer jacket, it would definitely be one of these. I keep walking past it in our local Topshop and looking at it longingly. And finally from Next the black and white trench coat (£90). I'm kind of intrigued by this coat! Some of the reviews say that the print is too much and I wondered whether that's why they photographed it in black and white. However it looks really good on Alex at the Frugality so I'm going to order it and see what I think. Despite it forming a huge part of their marketing material and being featured on huge boards in the store, our Next didn't have them in, which wasn't their fault at all but I do think that if a store is asked to have an image of a piece on its walls it should be at least sent some. But maybe that's just me! So there we are - gingham. 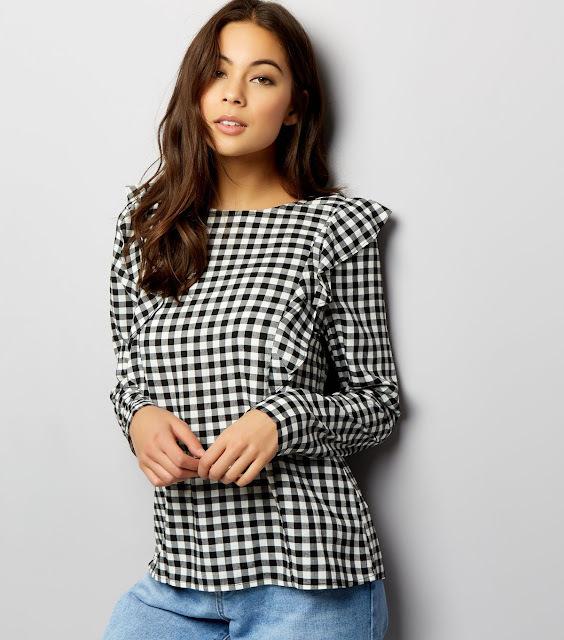 You'll see a lot of gingham on the High Street this season not only on clothes but also bags, shoes, bikinis and trousers, so if you haven't already done so, give it a whirl and let me know how you get on. Today I'm looking at all things embroidery related and oh my golly, you can't walk through a shop without being accosted by an embroidered top, a pair of jeans, a pair of shoes, a bag, a jacket - you name it, it's been embroidered. It's such a HUGE trend this season and so easy to tap into in a really minor way. Plus some may find it more accessible than the military, or army, trend that I looked at yesterday. First off, embroidered jeans. I tried some Topshop ones at the end of last summer and decided that I looked a plonky head in them so left them in the store. This year I may try them again. No doubt others will still think that I look a plonky head in them but I'm not ready to give up quite yet. 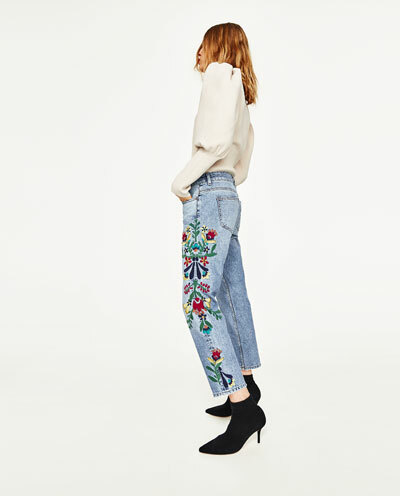 First off there are the Next embroidered jeans (£42). Quite a lot of the styles that I've seen seem to be heavily ripped, so it's just a question of finding that balance between pretty and roughed up. 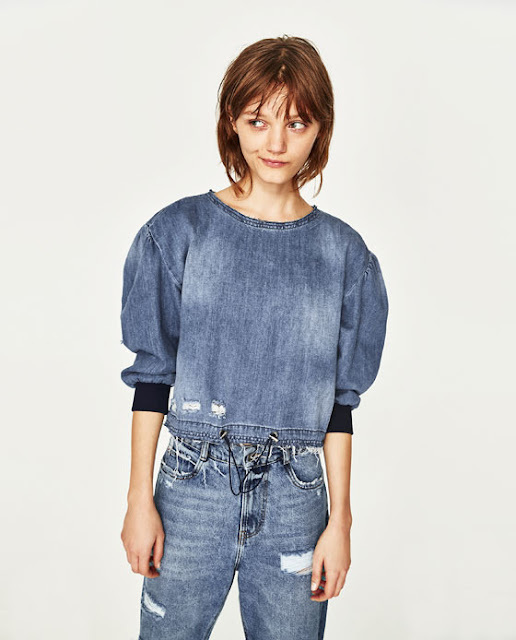 Anyone tried the Mom jeans yet? I really, really hated them to start off with but I'm definitely coming round to them - although they can make your bum look seriously big! 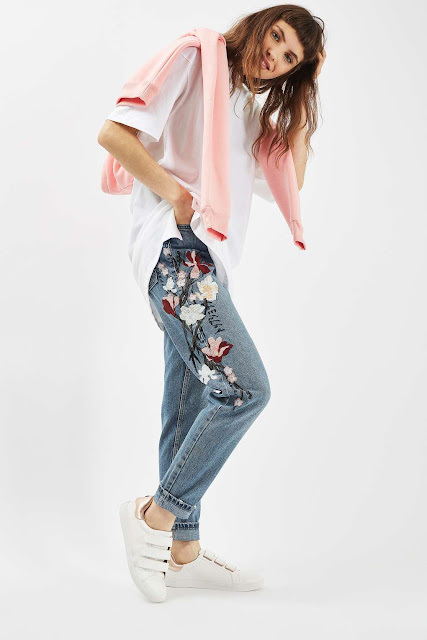 These are the Moto floral mom jeans from Topshop (£59). These Zara mid-rise jeans with embroidery (£39.99) are cropped. I love the floral but the cropped length can make them a little less versatile. Sometimes I like to be able to play with the length of my jeans, depending on the shoes that I'm wearing, or whether I've bothered to apply any fake tan to my ankles. 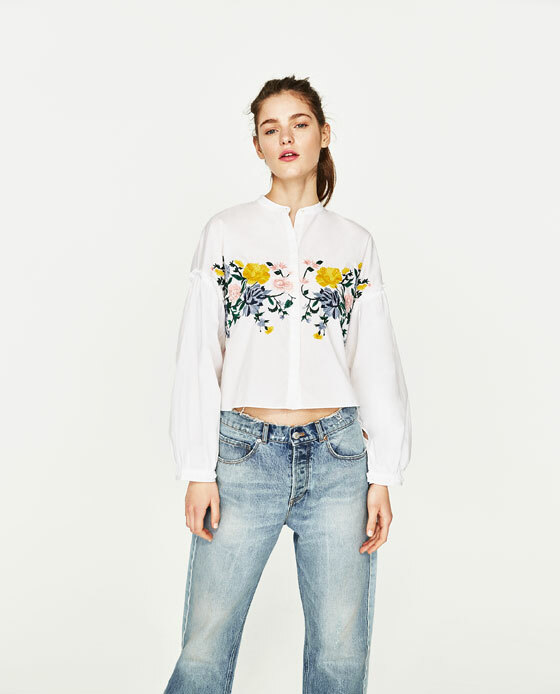 This mandarin collar floral embroidered shirt from Zara (£25.99) is a lovely little number and it's 100% cotton too, which is a bonus in the summer months. I don't think that us mere mortals would end up doing an abs flash in it. 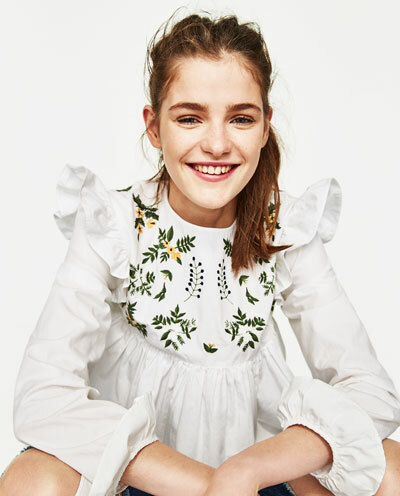 Here we're going full on peasant style with this embroidered off the shoulder top from Zara (£25.99). For some the volume may be too much whilst others will love it. The sleeves offer good coverage for those who would rather not have their arms on display and there are lots of different coloured tops in this style around. 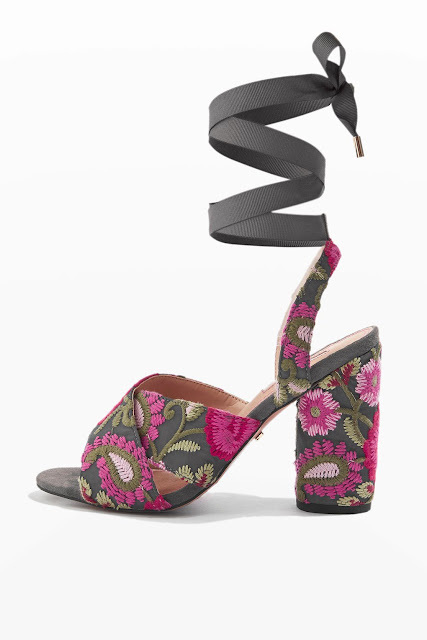 Then there are embroidered shoes, such as these tie sandals Topshop (£52). I can understand that people may feel that an embroidered shoe (even if not this style) is an easier option than a piece of clothing. Embroidered backless loafers would be a good option. Or even easier than a pair of shoes - a bag! 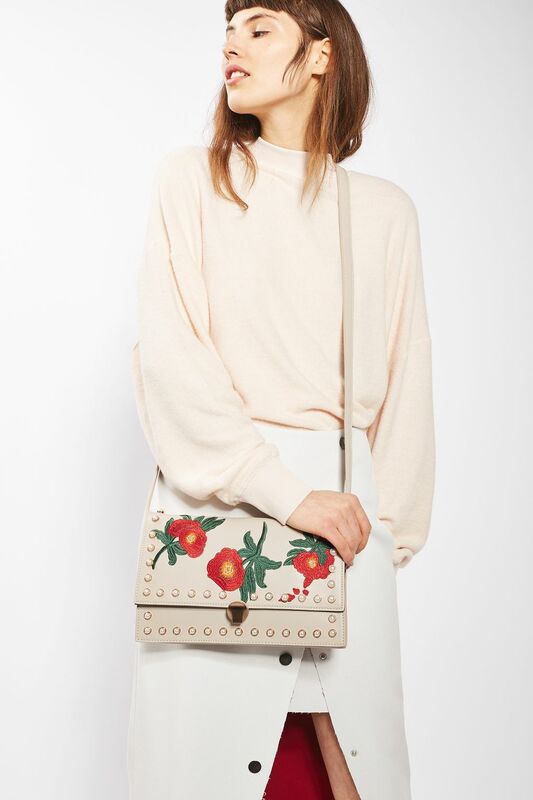 I like the detailing on this bag in addition to the flowers. 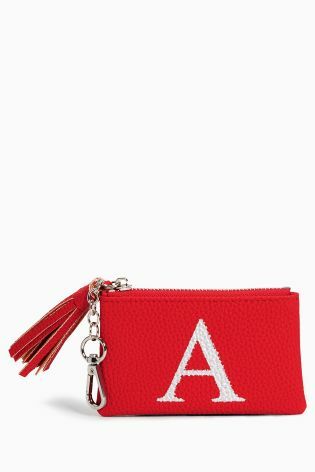 And a cross body bag is always such a useful addition to a wardrobe. This is the floral cross body bag Topshop (£35). Hopefully this offers up a little bit of an idea as to what is out and about there when it comes to embroidery. There are endless options and if the embroidery trend appeals to you, no doubt you will find something that you like. Do let me know how you get on and what you come across on your travels! Just tag me in a post @bethgoodrham_stylist on Instagram if it's easier. They were everywhere last year and it's the same this season too. White shirts. Blue shirts. Blue and white shirts, with frills if you like and maybe a stripe too. 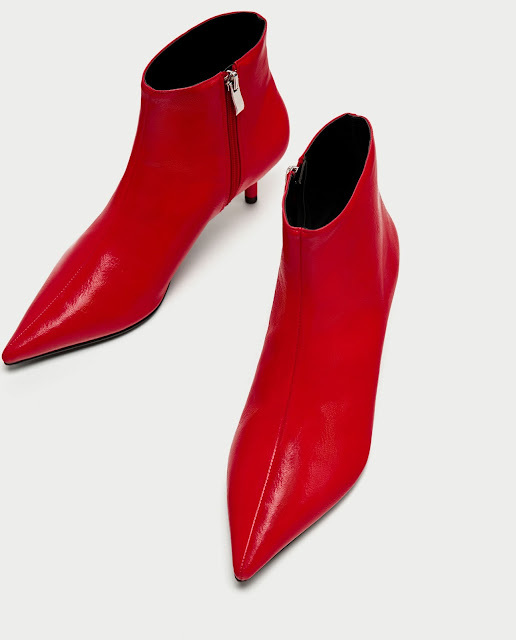 I could buy them endlessly and wear them endlessly, to the point that I wouldn't need much else in my wardrobe. They are just so fresh and fun and well, spring like. I'm not great with t-shirts, they just seem to drown me and look scruffy and some hippy style tops do the same. But a shirt or a blouse? Well it offers just the right level of "smartness" and "put togetherness" without me feeling too overdressed. 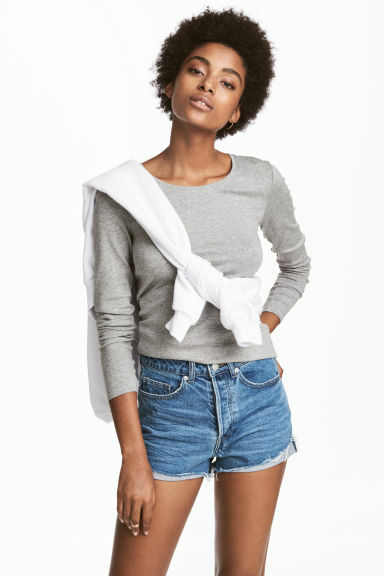 Plus I can layer them up or down depending on the weather which is good because I don't want to spend a huge amount on tops that I can only wear on the four sunny days of the year. But I don't want a corporate look - hence there needs to be a bit of fun, frill or frou-frou to get the balance right. There are so many in all of the usual Zara, Warehouse, Topshop and H&M type haunts but here are just a few. I spotted this Karen Millen super frill shirt (£115) a few weeks ago and immediately put it on Instagram. I love the fact that it's so fitted. Jeans and a frilly shirt make a perfect outfit combo for me. 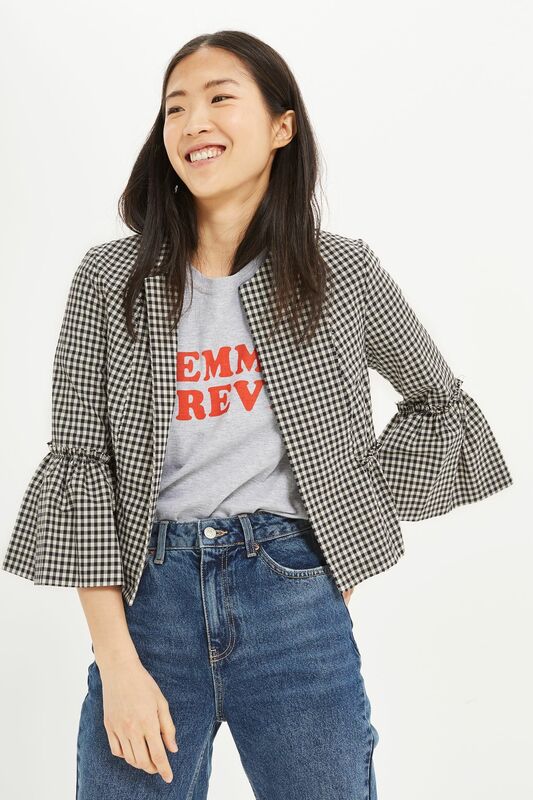 A frilly shirt just takes the jeans up a notch and gives me that feminine feel that I like, whilst still being practical and comfortable. I saw this white shirt in Whistles today. 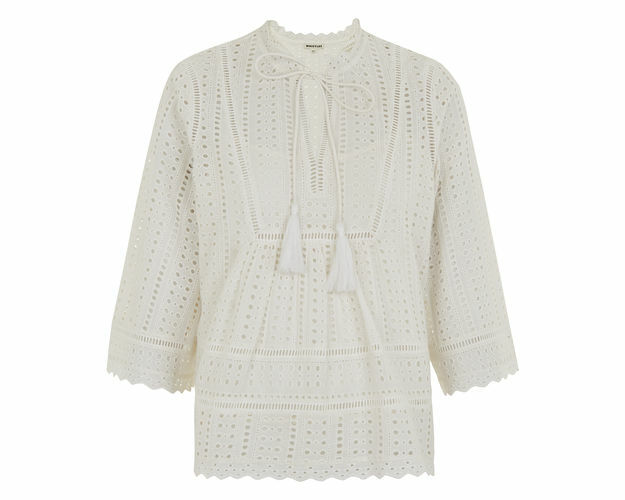 It's the Margo Broderie tasselled blouse (£87.50 in the sale) and was the only piece that I went back and looked at again. I can just see it working with so many things (OK jeans or denim cut offs) in the summer. But what else do you need, apart from some cool trainers or espies? 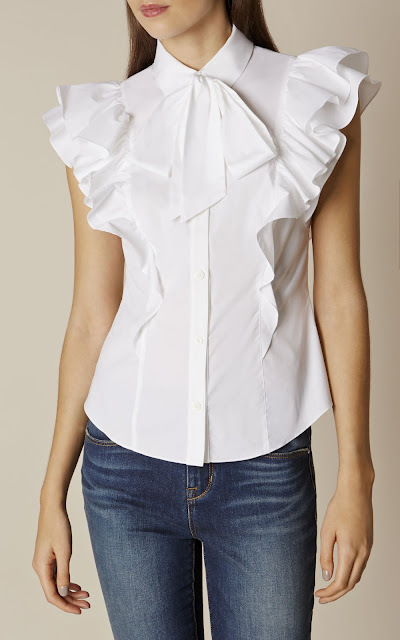 The one slightly different option that intrigues me is the cross over shirt Zara (£25.99). I've seen a few and am tempted to give one a go. 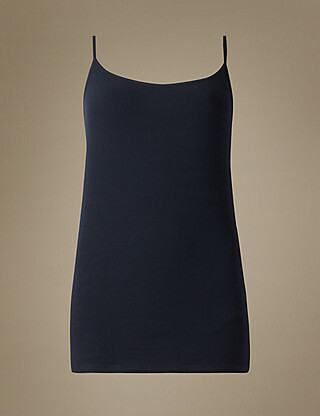 I also like that this has a V-neck so it's more flattering for those who are ample of bosom. In addition, because the stripes aren't horizontal, they are also more flattering. Imagine the potential for dishwasher hazards if it not only had this long dangly crossover bit, but huge sleevage too. A recipe for dishwasher disaster methinks! And then, just in case it does reach more than 17 degrees sometime between now and next winter, there's the asymmetric striped shirt from Zara (£29.99) which I love. OK so some clever wit is going to ask you if you've lost a sleeve en route (probably your husband) but that's no reason not to indulge your inner glam mam! And I've included this image because I like not only the bemused look but also the fact that it made it onto the Zara website. I think that if only she swapped her shirt for a blue or white one of the striped, frilly, off the shoulder, cross-over variety, life would suddenly all make a whole lot more sense.